From the humble beginning of just a handful of enthusiastic juniors in 2005, some 500+ youths aged between 7-16 years of age now play cricket under the umbrella of Cricket Switzerland's Youth Development scheme. The success of the youth cricket movement is spreading fast with numbers growing year by year. Youth cricket in Switzerland has three main centres – Zurich, Geneva, Basel – but all the regions team up to form Swiss sides to tour the UK and compete in international tournaments at Under 11, 13, 15 and 17 levels - most recently in Luxembourg. The cricketing year doesn’t stop at the end of the summer with some clubs having indoor facilities, and two indoor tournaments (hosted by Gingins and Basel) providing opportunities for competitive cricket in the autumn and spring. The highlight of the summer is the Zuoz Festival of Junior cricket and this has been joined by the Suisse Romande Tournament offering competitive outdoor cricket. Throughout the year the clubs also organise friendlies between each other. Zuoz, or rather the international boarding school Lyceum Alpinum that has a cricketing tradition stretching back 80 years, holds its own international youth tournament to allow Switzerland to play host every year. The sport has already reached out into several schools and proved a big hit with pupils – both boys and girls. This has allowed the steady integration of local youngsters into a sport unfamiliar in Switzerland. It is encouraging that there are now several international schools that have started cricket programmes and once these schools begin to play each other on a formal basis we will see another large increase in the number of young cricket players in Switzerland. The spread of the game has been assisted by these enthusiastic parents coming forward to participate in coaching courses. To date over 35 qualified coaches are turning up week for week to encourage and hone the skills of future Swiss cricketers with more coaching programmes planned. Regular coaching camps with professional coaches (most recently from Hampshire County Cricket club and Twenty20 International) provide additional opportunities for the development of the junior players and for the club’s coaches. 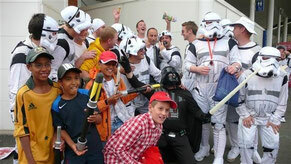 For more information on junior and youth cricket, please contact the Cricket Switzerland Youth Development officer.